The UB bulls beat Kent State 48-14 Tuesday night to improve to 9-1 on the season. AMHERST - Much of the year has been spent focusing on a team that lacks offense south of Buffalo. The team that plays to the north of it has plenty. 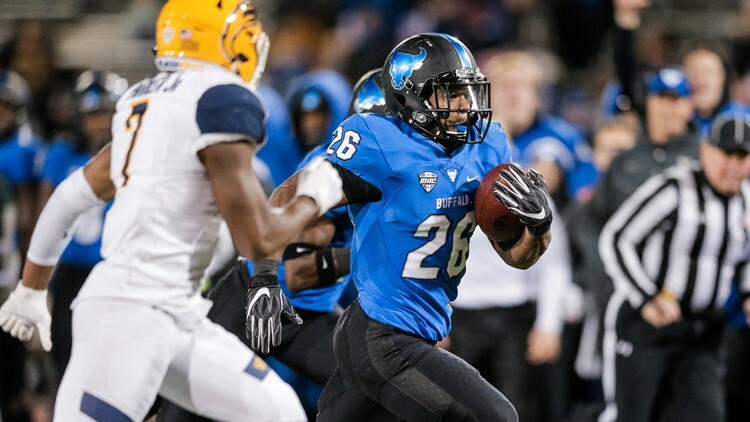 UB continued its amazing run this season with a 48-14 win over Kent State on Tuesday night. Running back Jaret Patterson led the way for the Bulls rushing for 187-yards and a pair of touchdowns. The Bulls rushed for a total of 358-yards on the night and outgained Kent State 478-183. Quarterback Tyree Jackson was 7/16 for 111-yards and a touchdown. He ran for one as well as the Bulls improved to 9-1 on the season.